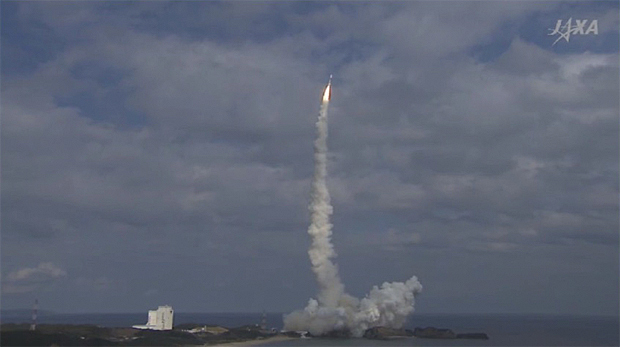 An H-2A rocket blasted off from Japan's picturesque Tanegashima Space Center late Tuesday, boosting an innovative science probe into space for a six-year mission to rendezvous with an asteroid, drop a quartet of small landers to its surface and collect soil samples before returning to Earth in 2020. In one of the most ambitious asteroid missions ever attempted, Hayabusa2 will spend about 18 months flying in close formation with asteroid 1999 JU3 and even release a copper impactor designed to blast out a small crater in the asteroid's surface. The probe will then attempt to collect pristine subsurface soil samples that could hold clues about the role asteroids might have played in seeding Earth with the water and organic compounds necessary for life. All told, Hayabusa2 could collect up to a gram -- .035 ounce -- of material before returning to Earth, according to mission managers with the Japan Aerospace Exploration Agency, or JAXA. "Scientists want to get materials from inside of the asteroid," Hayabusa2 project manager Hitoshi Kuninaka said in an interview with Spaceflight Now. "That is a very difficult operation. Once we release the impactor, it will be ignited about 40 minutes later. We cannot stop that ignition, so before the ignition, the spacecraft will do an escape maneuver to the other side of the asteroid (to) avoid serious damage. I think that is one of the most difficult operations we have ever done." The Hayabusa2 mission comes on the heels of the European Space Agency's successful rendezvous with a comet with its Rosetta spacecraft and Philae lander, which made the first touchdown on a comet Nov. 12. Hayabusa2 is Japan's second asteroid sample return mission, and its most ambitious robotic exploration flight to date. Running a few days late because of bad weather, the $300 million mission got underway at 11:22 p.m. Eastern (1:22 p.m. Wednesday local time) when the 17-story-tall H-2A booster's hydrogen-fueled main engine roared to life followed moments later by ignition of two strap-on solid-fuel boosters. Belching a torrent of brilliant flame and churning exhaust, the rocket quickly climbed away from the rocky seaside launch pad on a southeasterly trajectory, smoothly accelerating as it consumed its load of propellants. The climb to space appeared to go smoothly, including an upper stage rocket firing that completed the initial launch phase. The solar-powered Hayabusa2 spacecraft was expected to be released from the upper stage after a second rocket firing an hour and a half after launch. The second burn was designed to put the craft on a trajectory that will bring it back to Earth in December 2015 for a velocity-boosting flyby, setting up a rendezvous with asteroid 1999 JU3 in the summer of 2018. The target is about six tenths of a mile across, rotating once every seven hours and 38 minutes. Ground observations indicate it is a C-type asteroid, rich in carbon compounds and possibly water ice. Comets and asteroids are believed to be left over from the birth of the solar system 4.6 billion years ago. They may have brought water and organic compounds to Earth, but it's not yet known if they played a significant role in the development of life. Once on station and flying in formation with 1999 JU3, Hayabusa 2 will carry out extensive remote observations using a suite of sophisticated spectrometers and cameras to map the asteroid's surface and general characteristics. The spacecraft also will drop four small landers to the surface for close-range measurements. Three of them, known as Minervas, will hop about the surface to change position. The fourth lander, known as MASCOT, was provided by the same German space agency team that contributed to ESA's Philae comet lander. "Philae is about 100 kilograms, while MASCOT is only about 10 kilograms (22 pounds)," Kuninaka said. "It's a very small landing machine, but it is packed with instrumentation. One instrument is a spectroscopic microscope. It will take an image from the surface of the asteroid and make very precise measurements. It also has a thermal imager, a manipulator, and so on. We expect very exciting scientific data from MASCOT." Equally exciting, Hayabusa2 will descend for a series of low-gravity touch-and-go landings, using a stinger-like collection tool to capture up to three tiny soil samples. To uncover soil below the surface, Hayabusa2 will fire an impactor at the asteroid to blast out a small crater. The spacecraft then will descend for an attempt to collect pristine soil samples unaffected by the space environment. "Learning about asteroids is important for the future of space exploration," Kuninaka said. "This is a difficult mission, but in order for humans to expand from Earth into space it will be necessary to meet challenges. We need a lot of technology and information about the solar system, and Hayabusa2 will make a big step in these areas to help us be ready to plan and collaborate in the next step of space exploration." Hayabusa2 builds on lessons learned from Japan's initial Hayabusa mission, which returned to Earth in June 2010 with samples collected from a small asteroid known as Itokawa. That mission was hampered by a variety of technical problems and Hayabusa2 was beefed up accordingly, equipped with more powered ion engines, better instruments, faster communications gear and more capable backup systems. NASA's globe-spanning Deep Space Network will provide communications support. "Going to a far off asteroid and returning with samples of it for the first time, these are tremendous technological challenges and our success in meeting them has brought world wide admiration," Tetsuo Tanaka, a senior JAXA manager, said in a video overview. "For the Hayabusa2 project, Japan's development of its own deep space exploration technology aims to lead the world in that technical field."